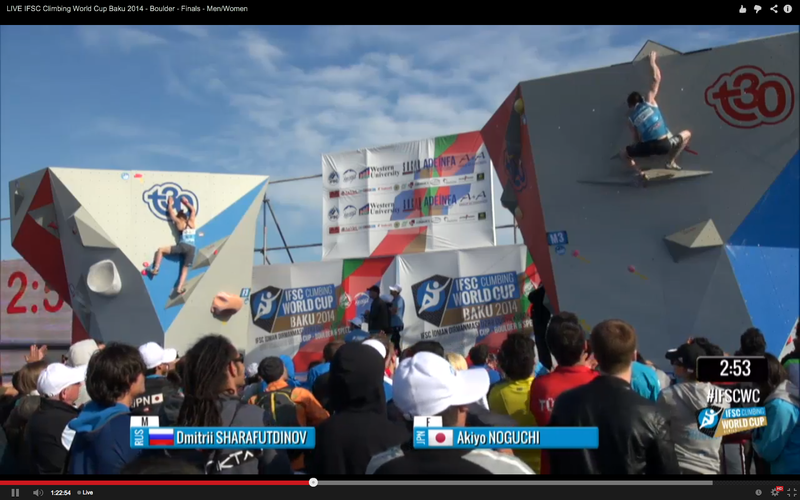 The 2nd stop of the 2014 IFSC Bouldering World Cup was in Baku, Azerbaijan. Move right to that yellow jib on the bottom of the bottom visible triangle in the pic above, drop knee, cross left to top of two slopers, match right in on bottom sloper, high left foot, right hand up to bonus, high left heel, cross to volume edge, match, pop to last hold. 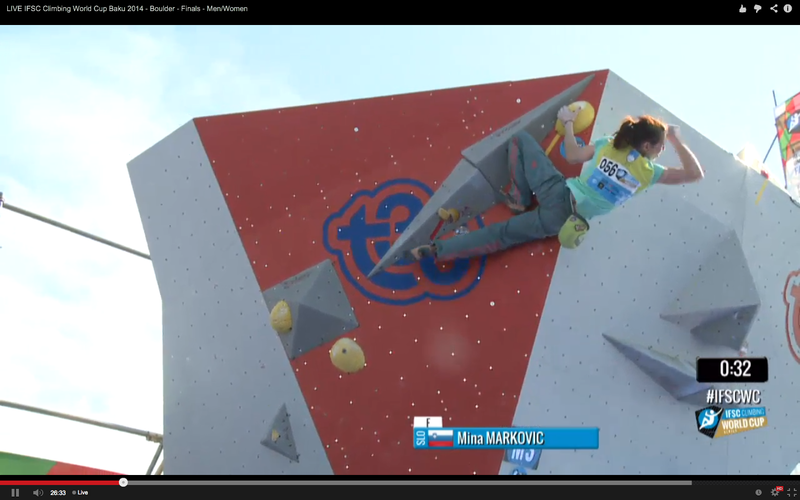 Mina Markovic came out first and climbed beautifully to the bonus, then fell trying to cross to the volume edge above her on her way to the final hold. Next go she got a higher, more secure heel, got the volume edge, and still struggled a bit before finally just jumping to the end. Mina trying to figure out the end. Mina in position for the jump. She underclung the volume to get her left heel out so she could jump. 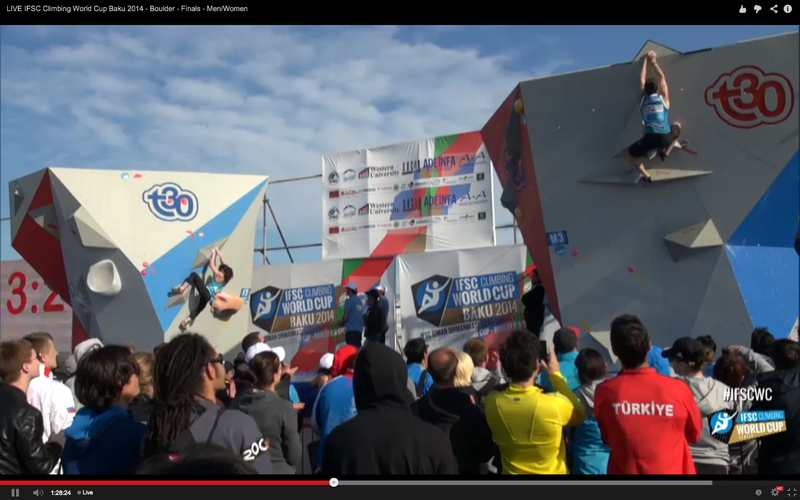 This last two moves seemed to be the biggest difference in the problem, with taller girls jumping immediately and the shortest competitors (Mina and Jule) both falling. The hold seemed decent once they jumped to it. 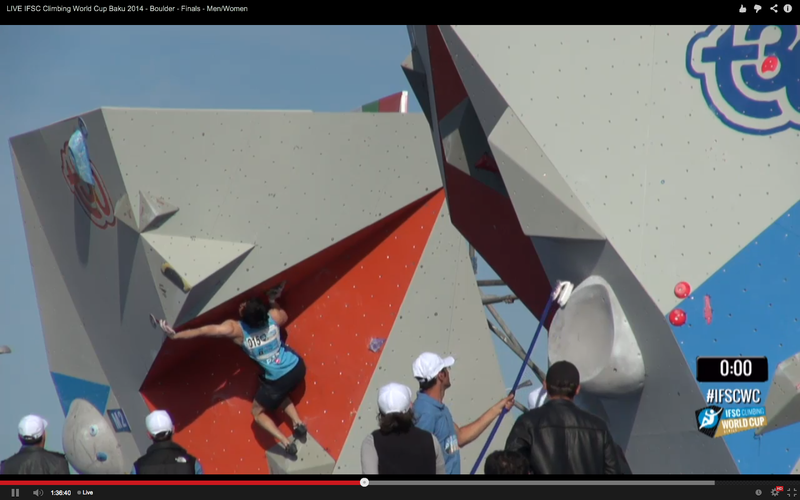 Jule fell first go, then second go jumping to the final hold when she seemed to miss it. Meanwhile on the Men’s problem Killian flashed, and someone reset the clock, so after Jule’s second fall she had to sit around for several minutes while they figured out what was going on. 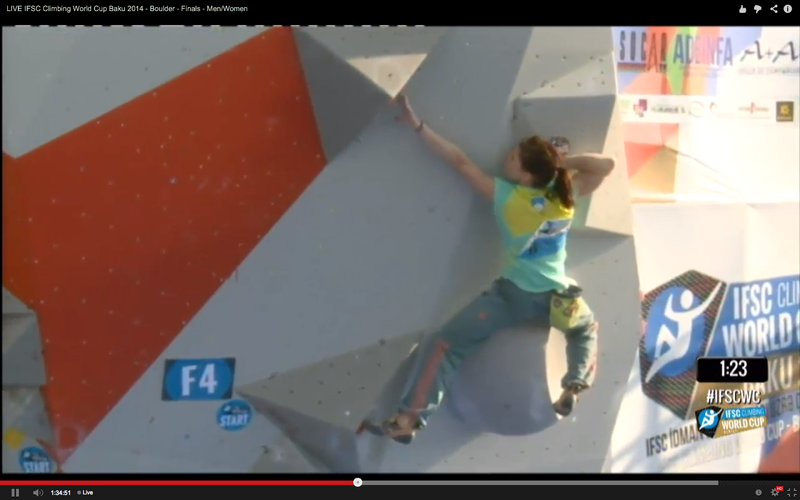 As soon as she could climb again she hiked the problem and the last move looked a little desperate but she caught it. 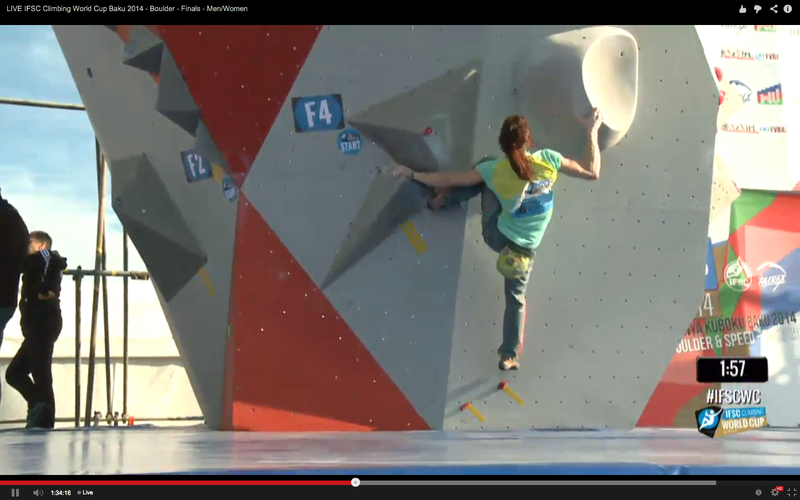 Shauna rocking the dropknee 2nd move. In comparison, Akiyo just pulled up and moved to the last move slowly without her feet cutting til she had it. Anna and Shauna both quickly thugged through the problem. 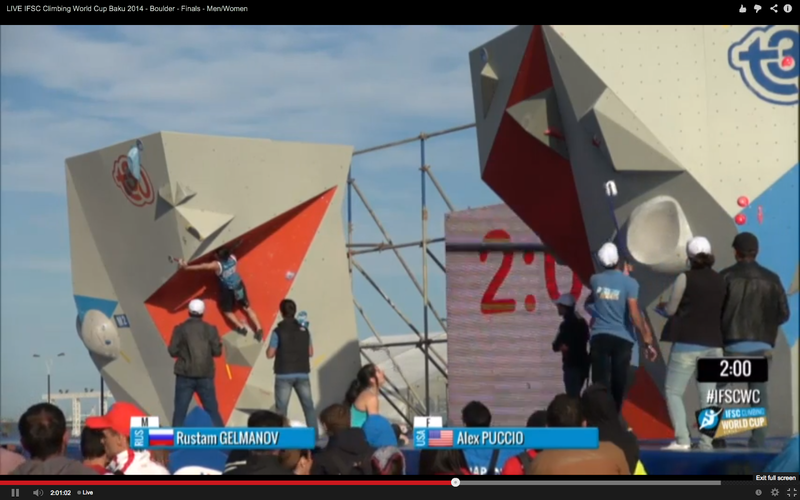 Alex got bonus and finished the problem 2nd try. Alex staring down the end. 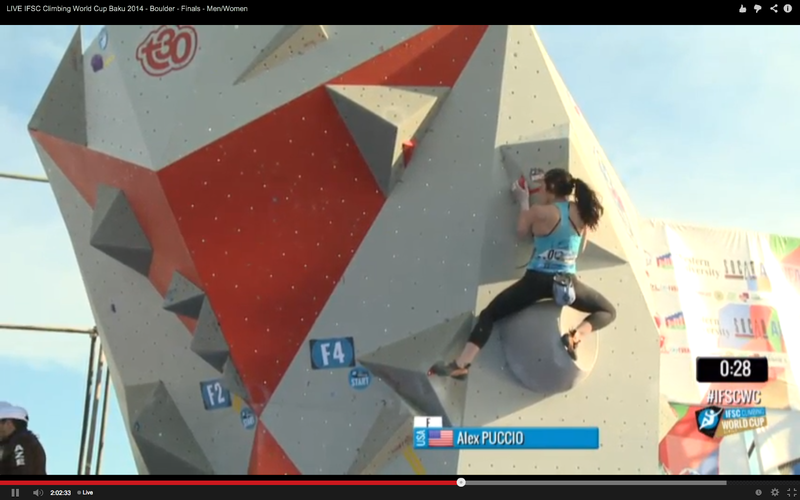 Rock left and double dyno to two holds, the higher of which was the bonus. Left hand out, high right foot, right hand up to volume, perch and stab for final pocket. Again, seemed like the shorter guys suffered a bit more. 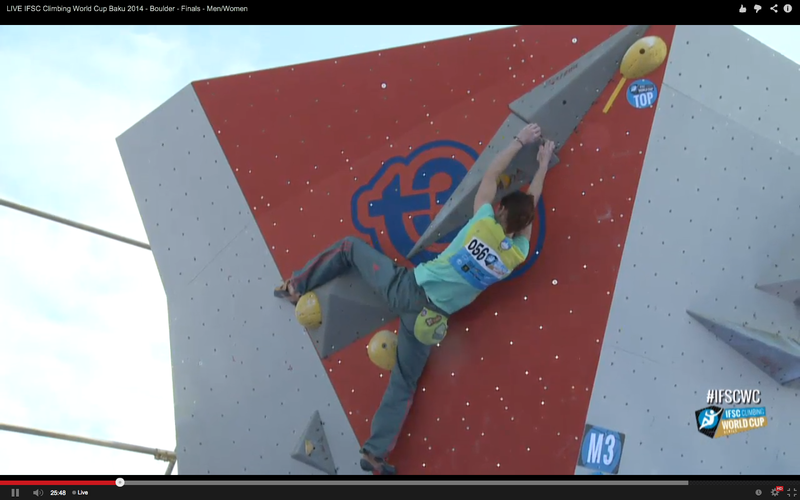 The first move was sort of a one-two dyno to two holds on the arete. 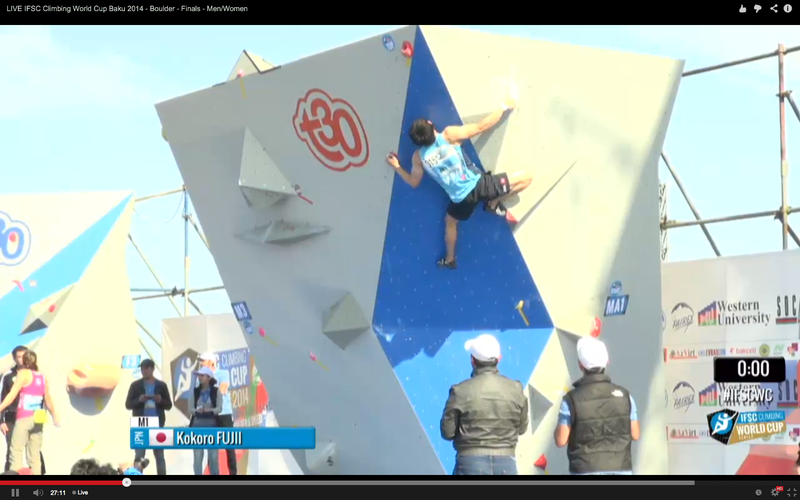 First out, Kokoro Fujii took eight tries to do the first move, but once he did it he finished the problem just after time ran out. 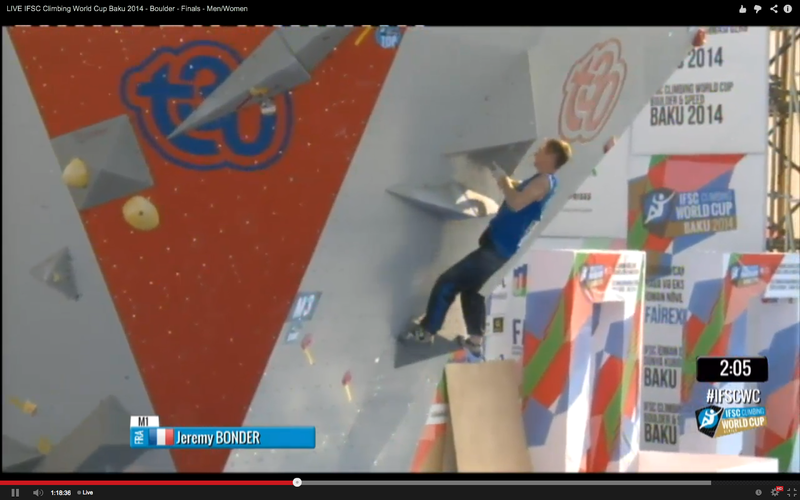 French climber Jeremy Bonder took four goes. 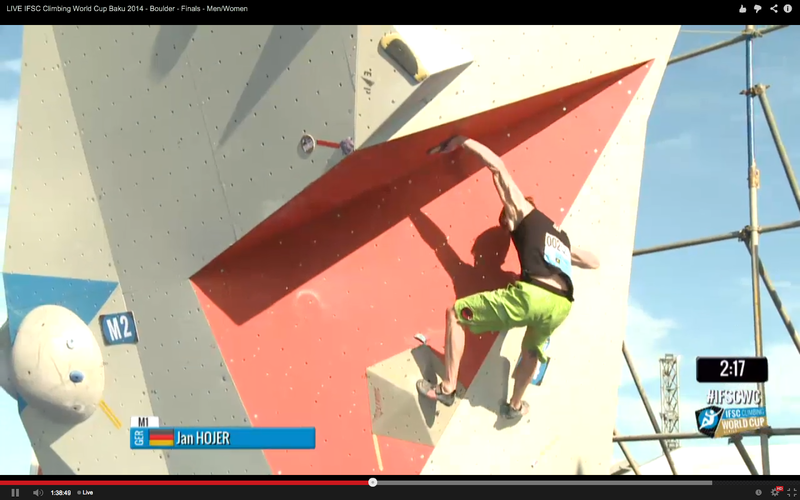 Jan Hojer hiked it, skipping a hold. Kilian fell once, then hiked it. 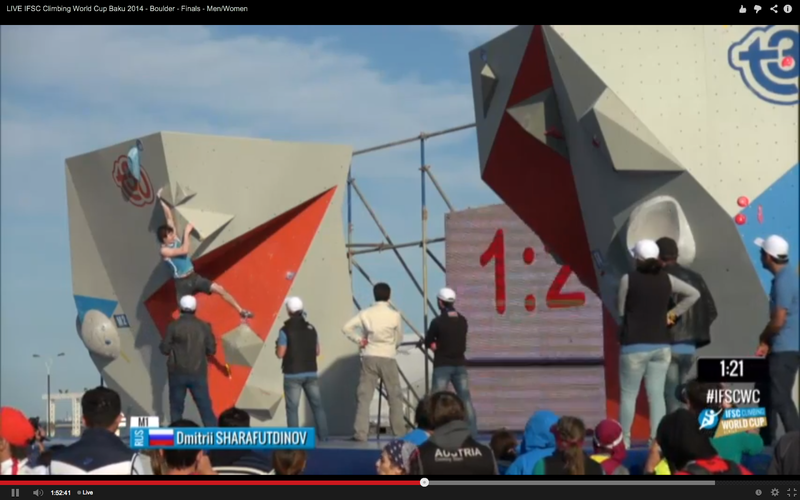 Both the Russians went static right hand cross first, then crossed up to the bonus and matched it before continuing. Both flashed. Dmitrii going right hand first. Big volumes. High start, jump feet up to high left foot, rock left, match, up left again to bonus, cross to high triangle, match to get left hand on the part with the thumb catch, right thrutch to the finish off. Last move off a right foot or keeping feet out left and swing-jumping, which is what most people did for success. Mina fell at the top and didn’t finish. 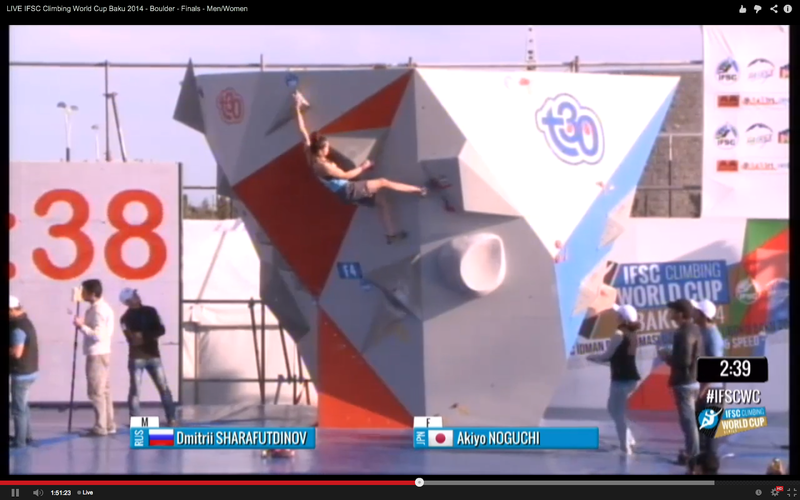 Shauna flashed with what looked like a knee scum and then a beautiful backen-heel at the top. 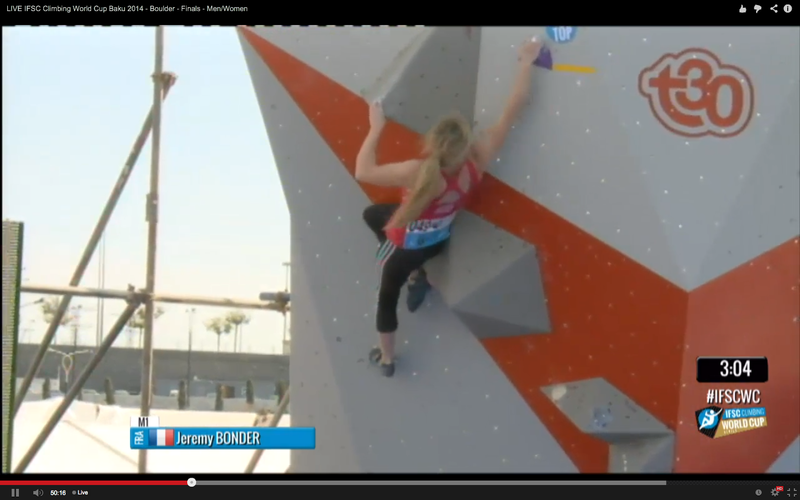 When she got down she pointed out a loose hold to the judges. Shauna backen-heeling to the finish. 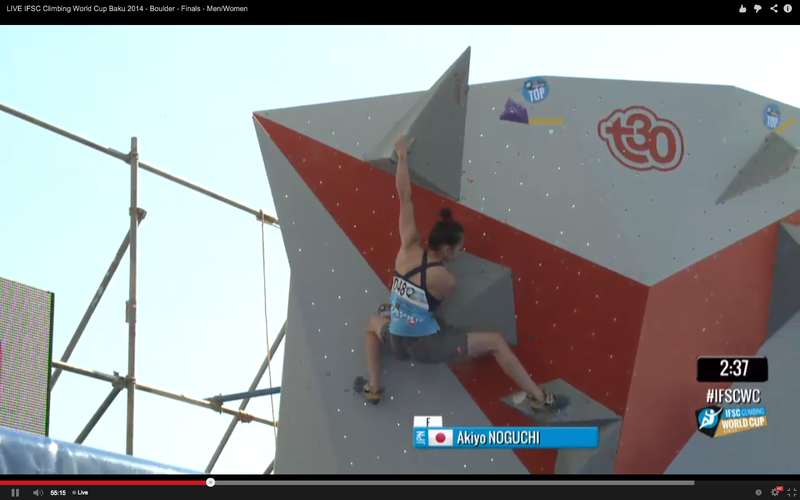 Akiyo looked extremely uncomfortable at the top and fell off the last move after looking like she couldn’t quite get up over the right foot. Fell again somewhere or before that. Next try she moved faster at the top and grabbed the top hold to finish. Akiyo setting up for the last move. 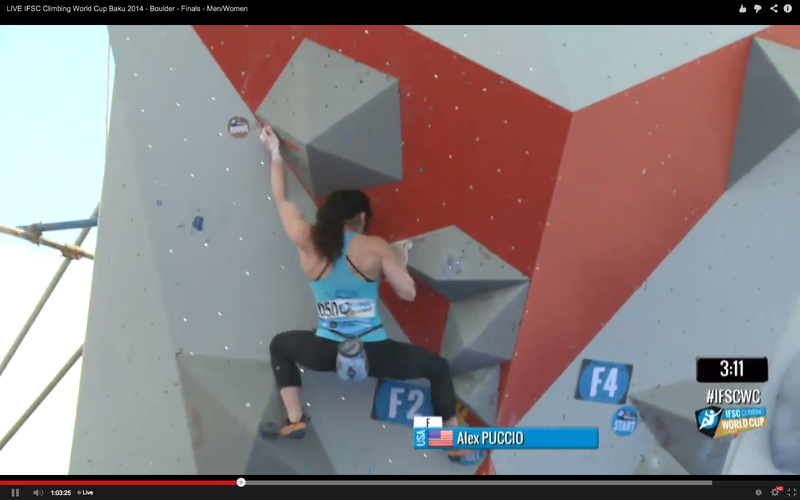 Alex hiked her way through the bottom, then moved too quickly to the last hold and just missed it. Fell there again. Fell in middle. Bummed. Alex moving to the triangle. She matched it and fell moving up right to the last hold. Jeremy working through the middle. Big circle volumes, awkward looking leftward moves with a huge left foot triangle and a slippery looking mantle at the top. Start with a hand and nearby heel up right, lower left hand and low left foot. Cross right to hold on volume. 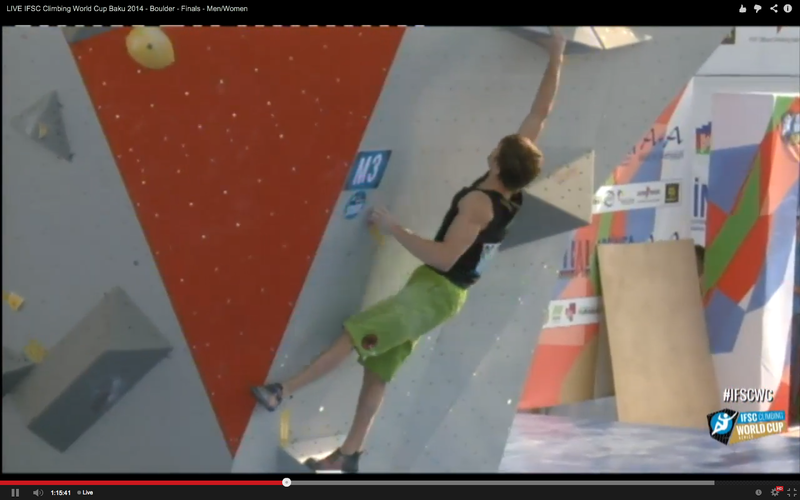 Left to the side of the volume and/or again to the left wall, swing left, move up left with big triangle feet, get highest volume, mantle to stand on it, lean over in terror to the finish. Kokoro flashed to bonus, then fell from mantle and didn’t finish. Jeremy got up past bonus first go, then fell trying to get up on the 2nd to highest volume. Next go matched it and fell trying to get on the highest volume for the mantle. He sat on the right foot and thrutched for it and got a good handful, but then didn’t stick and slowly slid off. Jeremy rocking up to the bonus, trying not to slide off. 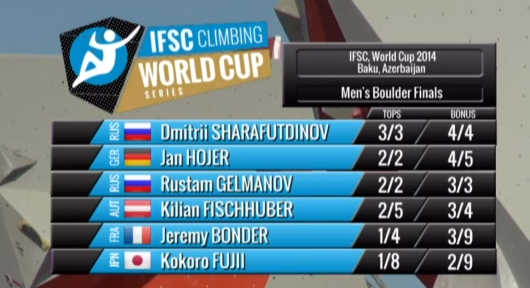 Dmitrii at the top. His method was scary but it worked. He mantled on top of the ball and then leaned. 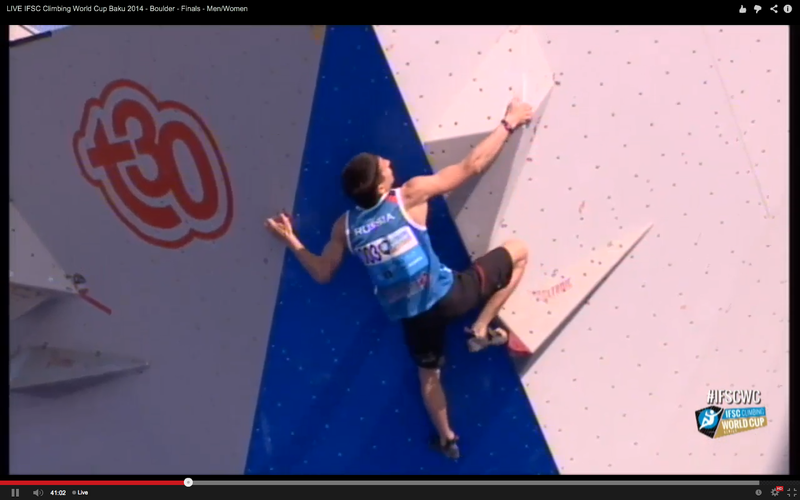 Kilian fell first go moving up to the highest volume (the bonus hold) when his heel slipped. Next go he used his toe and a knee scum, pulled against the no friction to get up, scored for bonus, then instead of mantling just tried to lean right to grab the finish as Jan did. He couldn’t quite reach and fell off again. Next go he did the same sequence, stood somehow a bit taller, touched the hold, threw a high left foot, crossed over and touched the finish hold with his other hand to score his top. Crazy. Rustam fell first go on the same moves up to the highest circle volume that were giving everyone else trouble. 2nd go was the same thing. 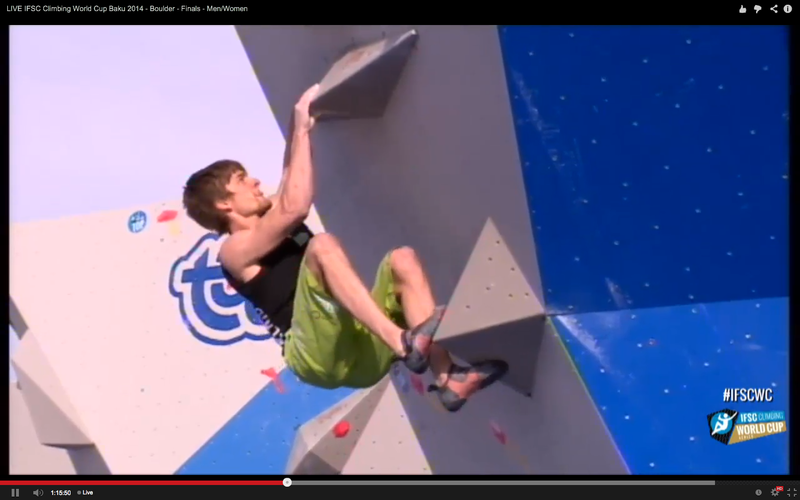 That hold looks super slippery and, as the announcers said, the shorter climbers had a real problem with those moves. 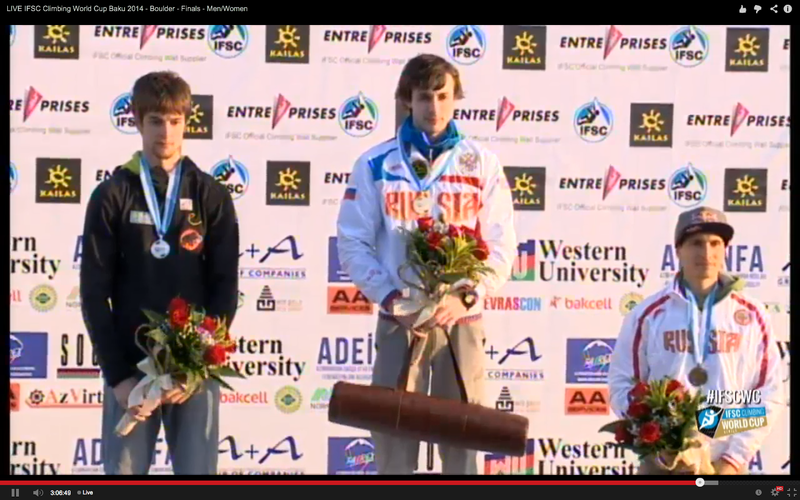 Rustam fell again (I think). And again. Couldn’t get onto the volume. It looked like the bad but high right foot was the beta for establishing on that volume. 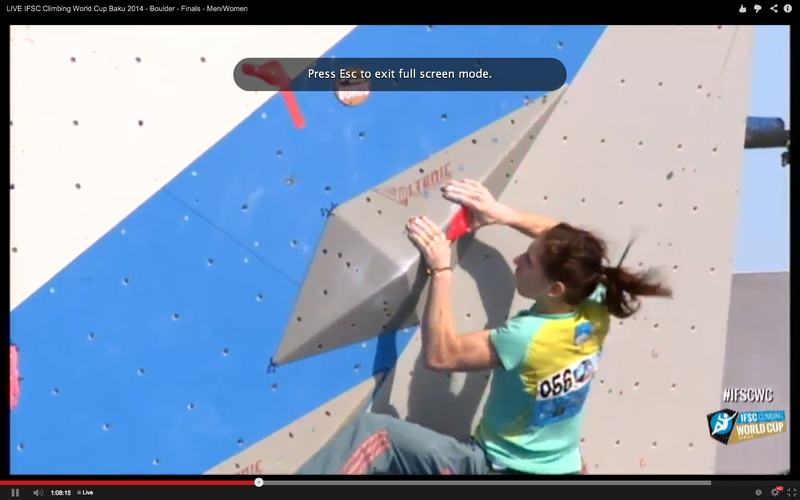 Anna matching the sloper with the thumb undercling. She’s riding a good right heel here. 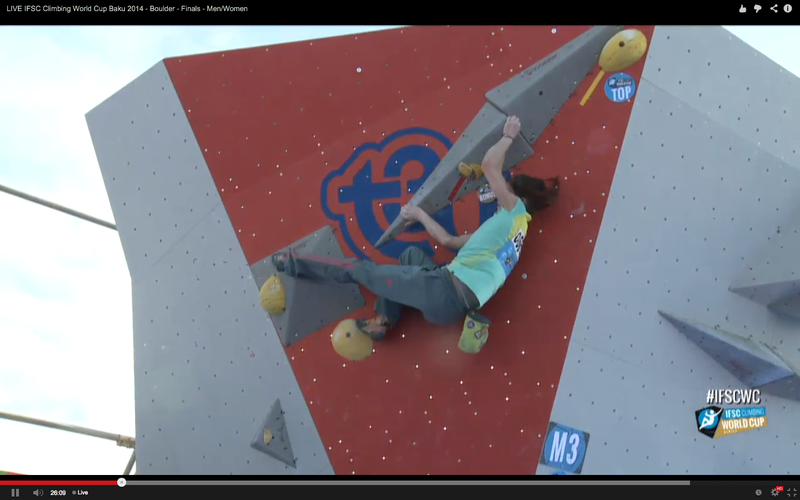 Big volume, swing left to crimp on volume, heel, under-thumb jib on a 2nd volume, match it (where Anna is above), tiny painful looking crimps, can flip thumb to undercling, and a high foot rock up and left, balance to match the bad finish jib. 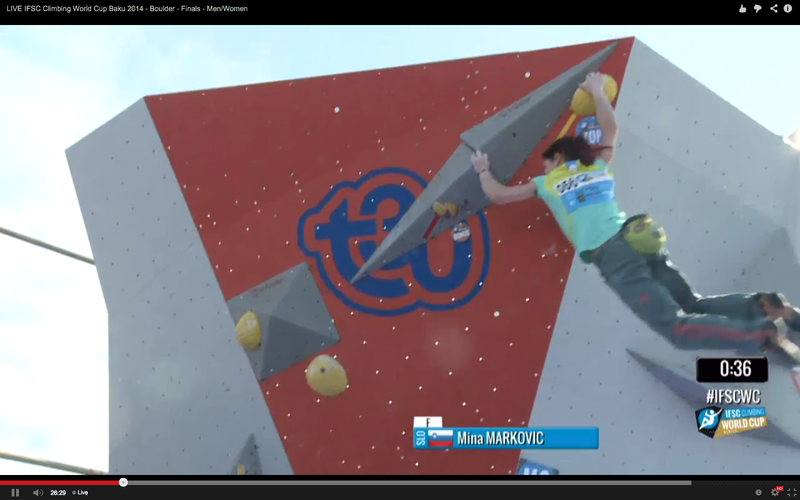 First go Mina, probably one of the best crimpers on the planet, got to the top but couldn’t manage to do the last move off two holds that the announcer described as nothing. 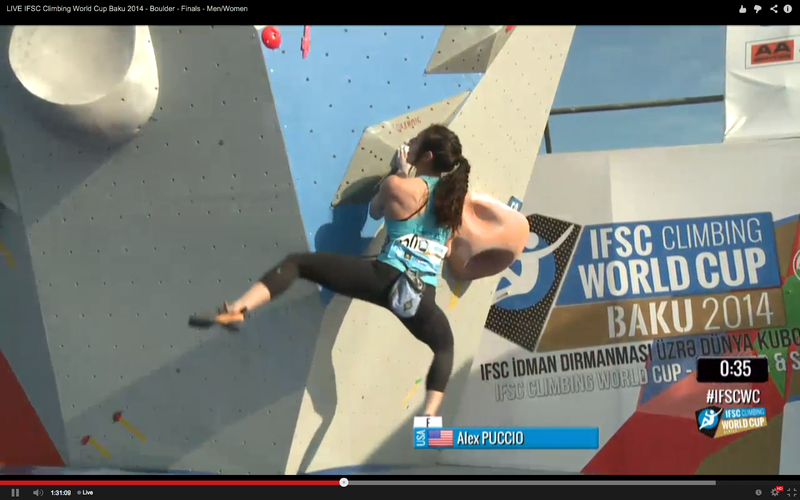 Next go she moved left and got her foot up before standing to those holds, then rocked left to the finish. Mina pinching the thumb and staring down the bonus. Mina rocking onto her foot. 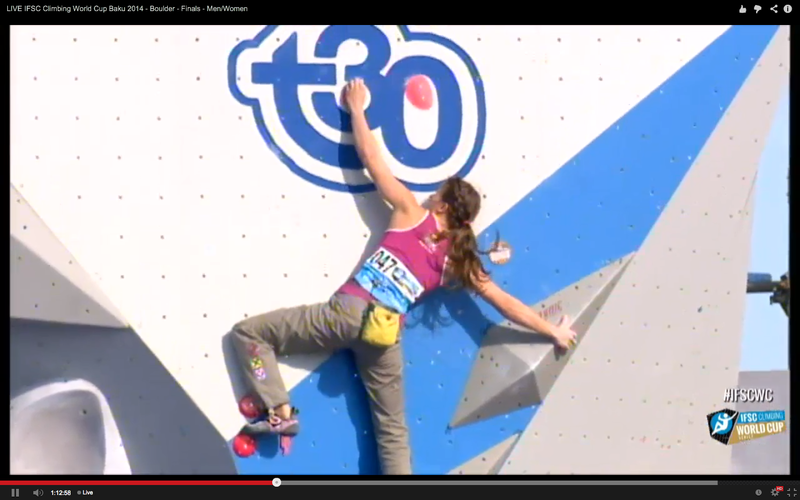 Mina on the bad holds “crimping on the Top 30 logo” as the announcers said. Jule flashed. The wind was blowing her ponytail straight out right the whole time. must have been strange to compete like that. Alex trying to campus to the feet. She did, and tried all 3, but none were good enough. Alex did the first couple of moves, then fell moving left. Fell on 2nd move. 3rd go hit 2nd hold, swung left heel up to get higher volume and match it, then fell trying to hit bonus. It looked like she couldn’t sit on the left heel. Next go went with right foot again like everyone else, shifted over to left toe, foot slipped as she hit the bonus and off. Didn’t score for it. Announcer said she’s trying to grab the bonus, when really it is is super slick and should just be touched as you sit on your foot before moving out left. Next go she tried to skip the high volume by campusing to the feet. She got to all of them but none was good enough and she dropped. Last go she got up high on the volume, realized that wasn’t going to work, tried to bump back down and fell. No bonus. Jeremy trying to get set for the last move. 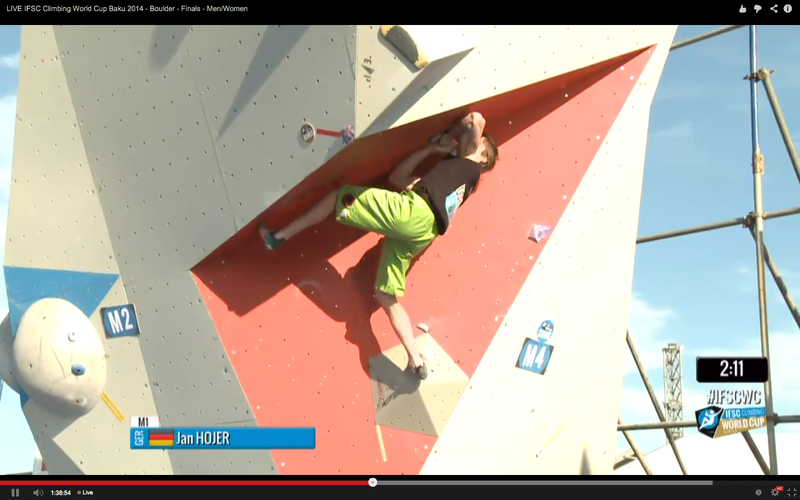 Jumpy first move (at least for shorter competitors) to two flat triangles put together to make sort of a space ship looking thing. Left side is better. Match and float feet right to clamp volume. Shuffle hands right. 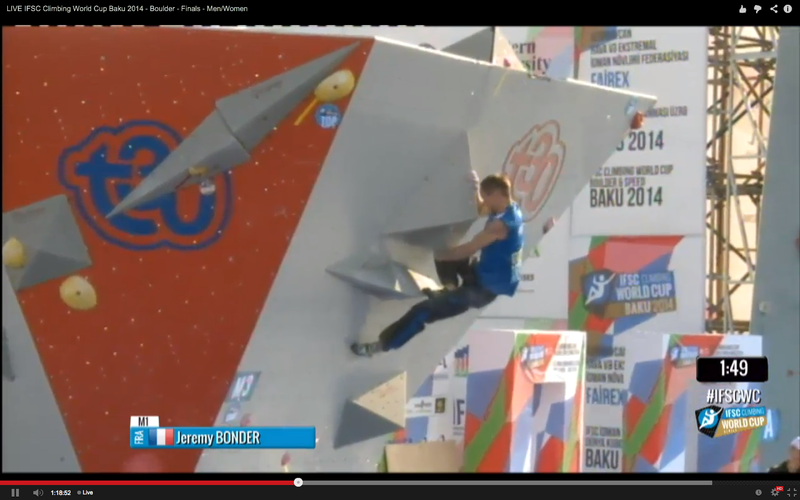 Stand into undercling triangle volume, feet up on space ship, balancy in control reach to top, which is a bad jib on a volume on top of the wall–kinda cool. Kokoro kept jumping to the middle and had trouble sticking it. No bonus. It looked like he might have been able to jump to the left side like Jeremy did and it would have been easier to stick. Jan staticing the first move. Jan nearly staticed but couldn’t quite reach. Did a tiny jump to stick the space ship, kept getting thwarted on the next move. Next goes he basically staticed the first move, then lifted off and moved feet right to clamp feet on a volume and match the space ship. From there he looked very scrunched and fell several times, sort of trying to mantle but unable to move up from there. 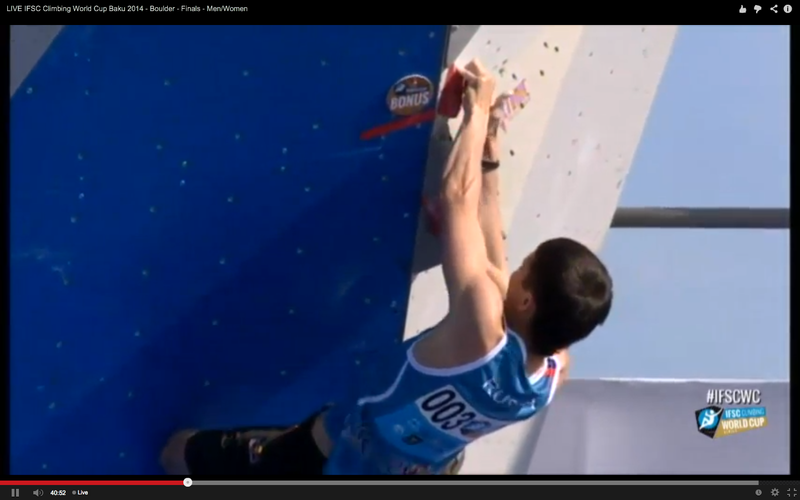 He did get the bonus point for grabbing the undercling triangle on his first go. Jan matching feet with a bicycle. Jeremy fell, fell, stuck but fell rocking his feet over. Stuck, matched, feet over, after some finagling managed to stand into the bonus hold (triangle volume undercling on a triangle volume) tried to stand up to the last move to the top but shot straight out backwards instead. Jeremy pressing into the undercling. Did beginning again, fell on undercling. Last go managed to get a knee jammed in, had a good guppy right hand on the top volume and underling right, twisted towards the top several times trying to generate but it the end it was too awkward and he fell. If he had finished this still would have been in 5th. 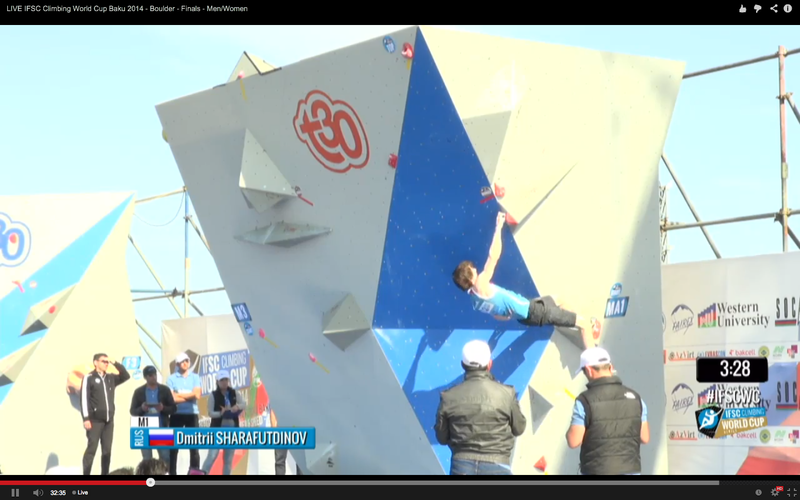 Dmitrii flashed the problem easily. Dmitrii making the match at the top of 4. 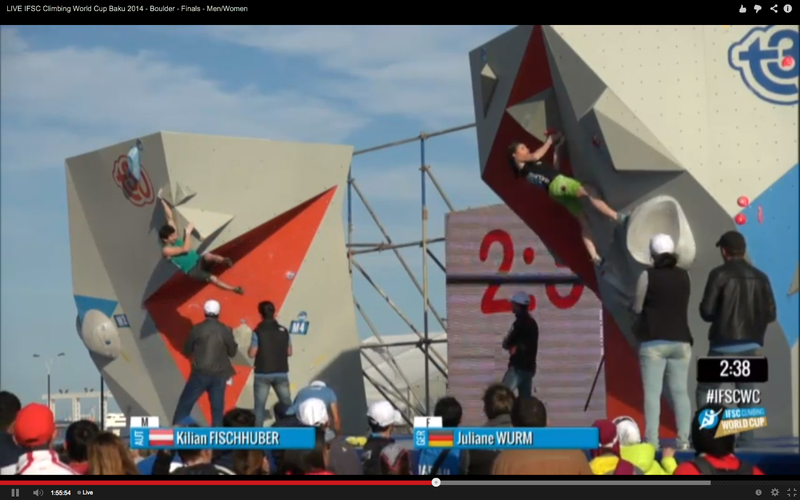 Kilian fell on the first move. He fell again after matching the space ship. Seems like hitting it in the middle is bad because you swing off. Establishing on the left, then shifting right, seems to be working better. Also, right and middle of the space ship are in the sun. Fell again. Fell again. No bonus. 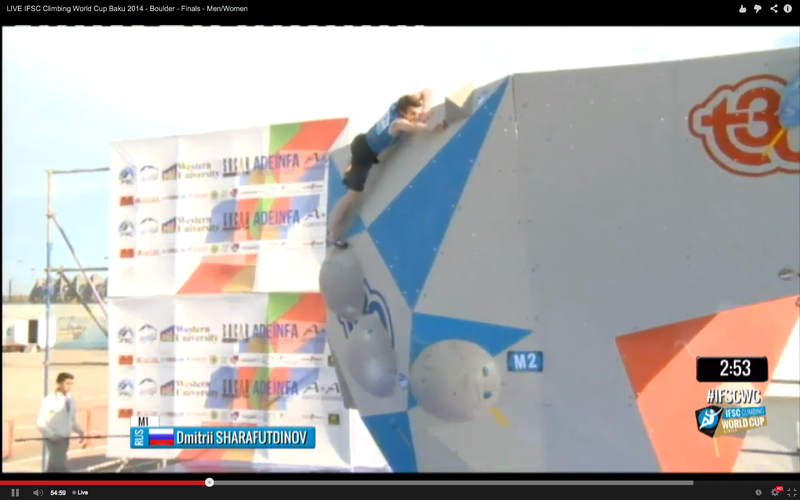 Rustam hiked the problem on his first try. Rustam matching the top of 4. Under toe for security so he doesn’t swing out as he matches. Volume blocked by another volume for the start, move right to big teardrop volume, foot jam, delicate match on top of it (apparently very slippery), rock up left to two jibs on a volume, one is bonus. Rock left on bad foot to gaston, press into it and match, up right cross to another volume at the top. The start feet are both out right so the sequence was put left foot on, right foot on (now you are established off the ground) then flag left foot out left to do the move. This caused some problems, as you will see below. Mina pressing into the gaston. She fell here her first try. Mina’s 2nd go she got into the gaston and pressed to match it but couldn’t get to the last hold. She wanted to go left but knew she couldn’t reach. Finally she moved up right hand and got it, but was stuck under the volume and fell trying to get a foot up so she could match. 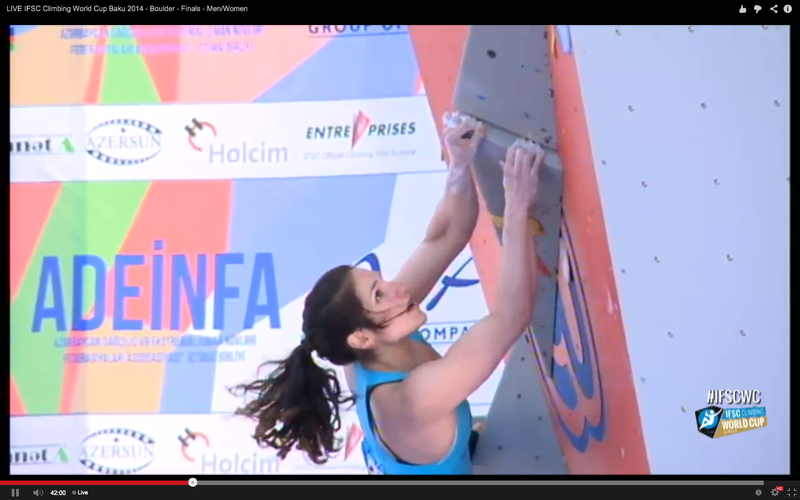 Anna went left to the last hold (like Mina kept trying to do but couldn’t reach) and flashed easily. Shauna has to flash. She gets on, does 1st move, matches bonus, drops. What? The judge called her off saying she didn’t start with her feet properly. 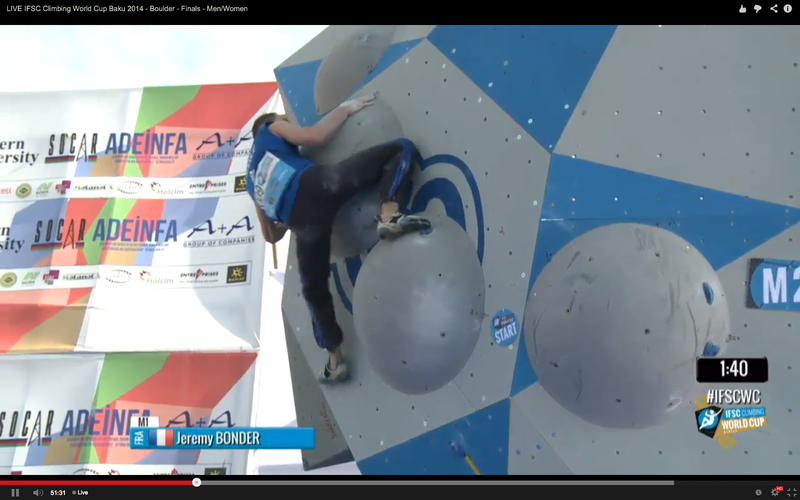 She gets back on, does the proper foot touch, and finishes the boulder left hand first. Does it count as a flash? If so, the announcer says, she wins. UPDATE: Announcer says she was called down for dabbing (touching the mat with her foot as she pulled off on her 1st attempt) so it counts as a try and puts her in 2nd. That is crushing for Shauna. This would have been her first gold. Announcer says she did contest it when she got pulled off, said she didn’t dab, so we’ll see what happens if they do a video check or something. UPDATE 2: In the only angle for the live feed they replayed Shauna’s start and though you can’t see her foot she does seem to dab and pull back up. It also looked like someone (not the judges) called for the judges to call her off. The whole thing is less than ideal. UPDATE 3: A kind commenter (see below) has said that most likely an IFSC Judge was helping the problem judges as they were local and inexperienced. Makes sense, and thanks to him for the clarification. Also, it’s important to note here that there was a lot of complaining about the live feed in the live comment box and on Facebook, but those of us who watch these should be grateful there was any video at all as it seems the conditions were challenging on many fronts. The weather alone looked like it was exhausting. 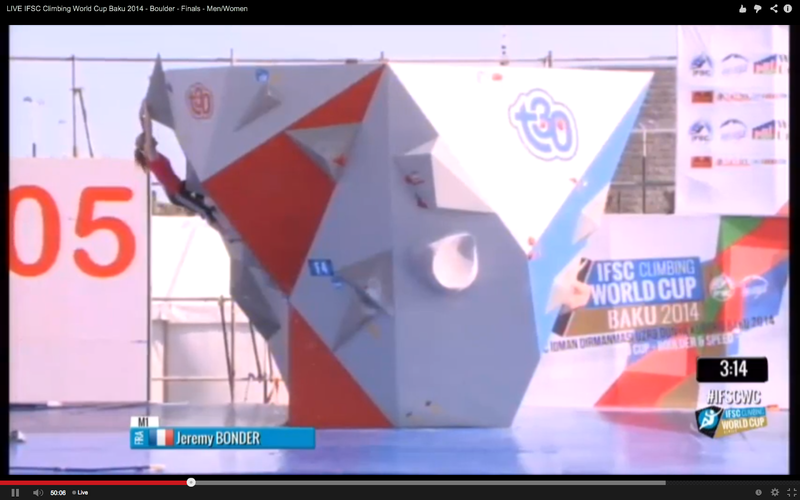 Thanks to the IFSC, Top 30, and everyone else for making the feed happen. Akiyo flashes pretty easily. Left hand static to finish like Anna and Shauna. Akiyo staticing the last move. Jule gets called off her first go same as Shauna. Next go she gets to the top. The last move looks quite reachy for her but she gets it 1st go with her right hand like Mina, but instead of falling works her right hand up til she can let go with her feet and left hand and hang match. She did this by pushing up against the right foot and riding the left hand undercling until her right hand was draped over the top, more positive angle on the volume. 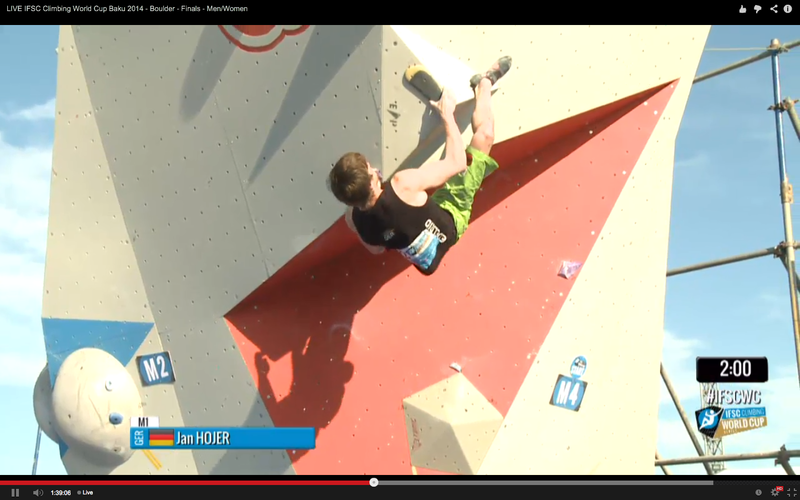 Jule at the top. Her right hand is high enough she can let go with her left. 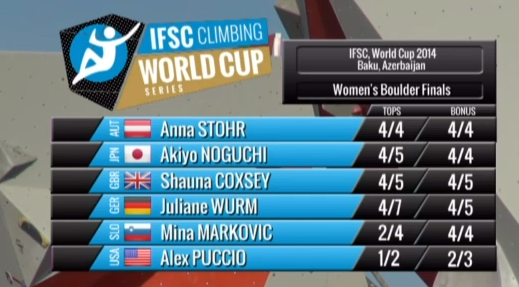 Alex unfortunately is in last already, which much be terrible for her as she’s been in first for the whole comp so far, flashing all the qualis and winning semis as well. She looks done already here and falls on the first move of the problem. Next go she gets to bonus and then falls reaching for the gaston. Next go she does 1st move and falls matching the volume. Next go she’s back up to bonus, chalks on the volume, gets up to last move as time runs out, falls jumping right to last hold. Ends up in 6th. 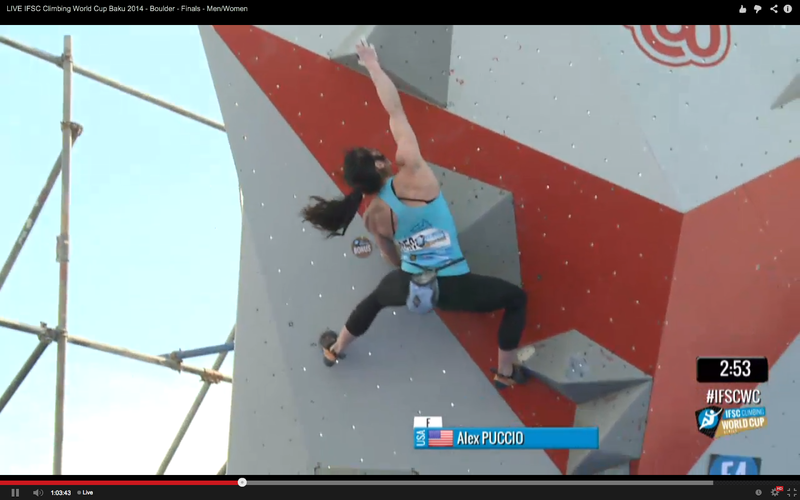 For some reason the IFSC site (and the result below) hasn’t yet given her credit for the 4th problem bonus, but she definitely grabbed it so I’m not sure what’s up with that. Alex camping out on bonus and setting up for the rock left. She got the gaston, pressed into it, and fell off the last move. 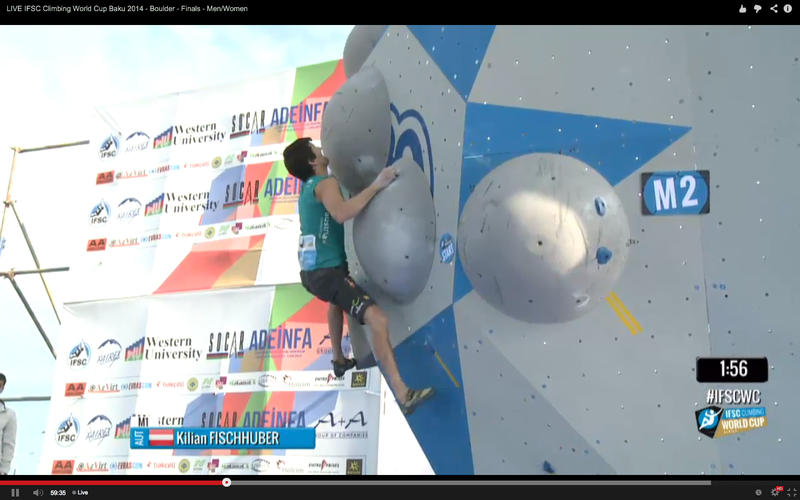 Kilian trying to hold the spin out on MF4. 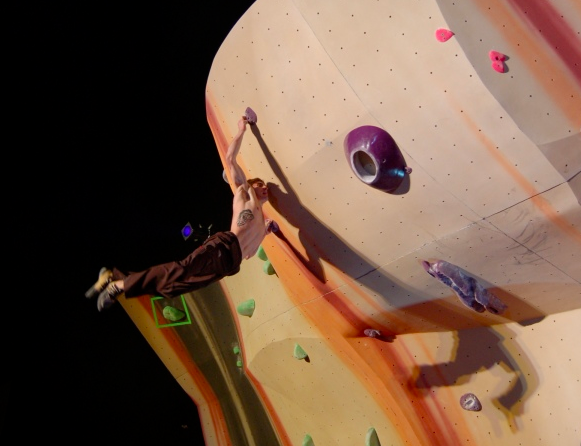 Hard pull on to establish on a volume, stand up into a corner roof, lean way out to a bonus, cross to a volume with a thumb catch, two triangle volumes, bad volume final hold so you have to keep your feet on and stay in. 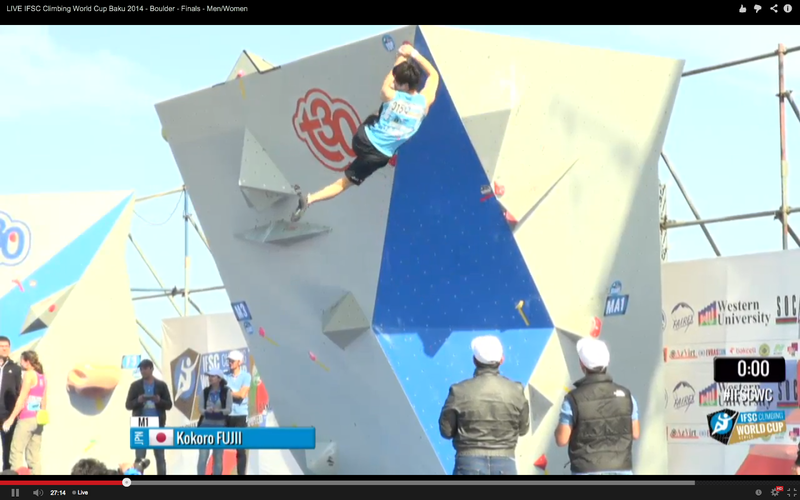 Kokoro didn’t get scored for bonus (or it wasn’t yet updated) but he seems to have grabbed it. So close! Kokoro must not have held the bonus long enough to be scored for it. 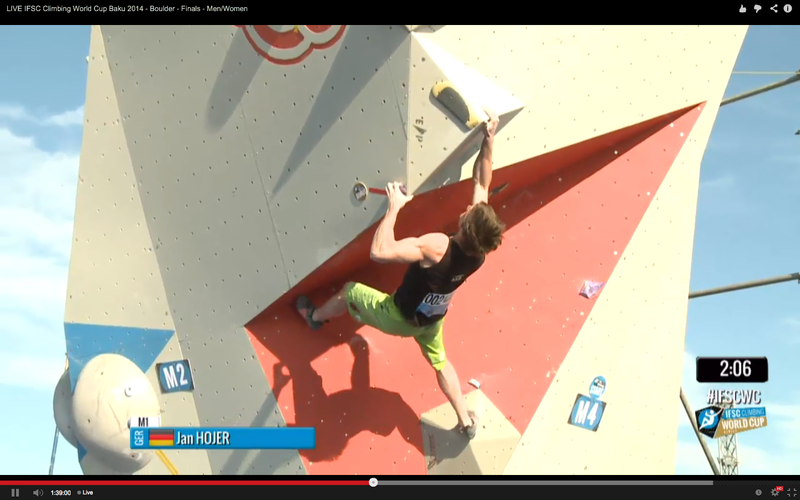 Jan got up nicely through the bonus on his 2nd try, got out around the corner, then slipped grabbing the next volume. He rested a long time, then got up into the roof and slipped just as the timer ran out. Bummer. Jan coming around the corner off the bonus. Jan trying a heel for the next move. He went up right but fell off. Jeremy is pressing up into the corner by rocking over the left foot and pressing right hand up (instead of matching like Jan did). Jeremy going right only into the roof. 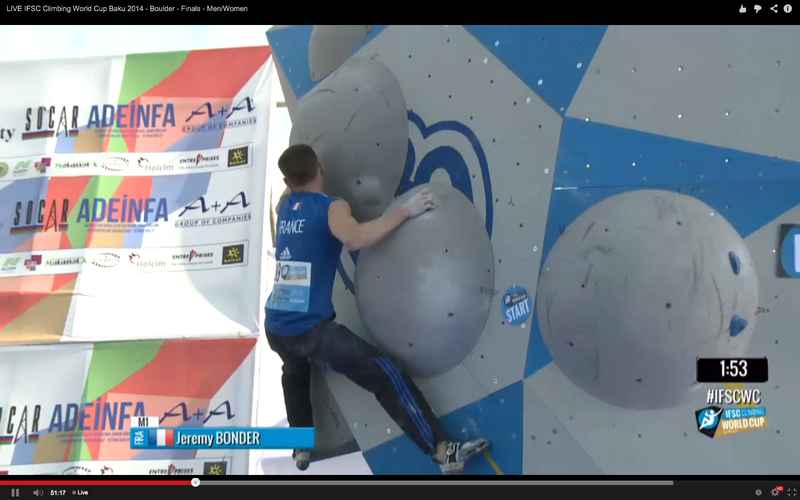 Like Shauna on the women’s problem, Jeremy also seems to be having some issue with the judges, maybe a loose hold that the setter is reinforcing with another screw. Jeremy gets a little more rest out of it. 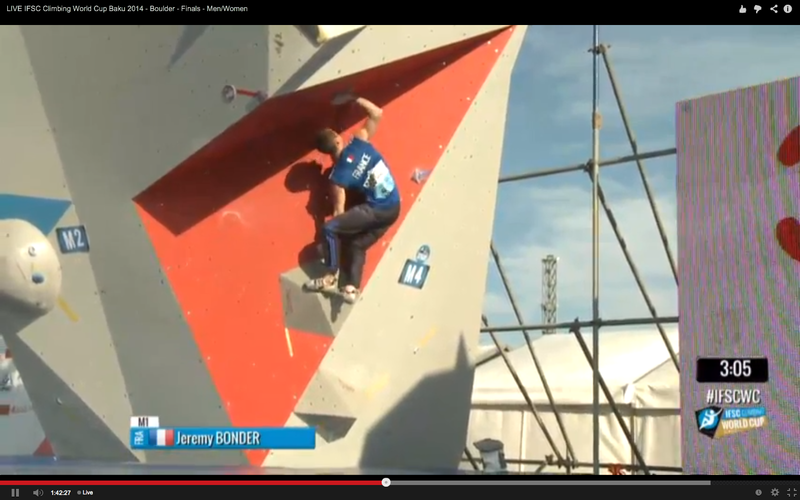 Now Jeremy is back on but he can’t seem to hold the 2nd hold. He’s it it several times right hand as a gaston and fell. Jan hit it left and matched, which looked better. He finally gets it, then falls rocking on left foot. 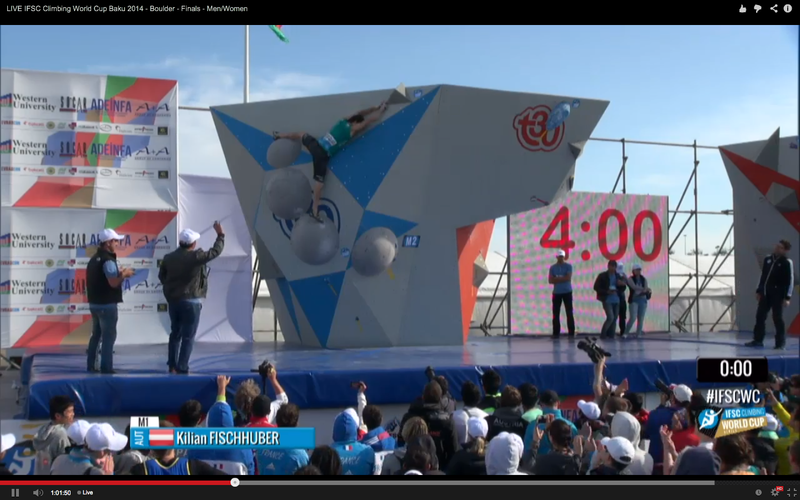 The buzzer buzzed but who knows how much time he has left–the technical threw the clock off again, at least on the live feed. Back on, does the 2nd move better, rocks over the foot, stands into the corner right hand again, may have finally hit time out, falls out of the corner right after. No bonus. Dmitrii climbs through the bottom crossing left to the 2nd hold and matching like Jan, gets bonus, comes out around corner, campuses left to triangles (instead of right like Jan tried) brings his right hand up to match in compression but falls off instead. Next go campuses up left again, slows down to control it which he does, but falls trying to stick the right hand when he grabs the other triangle. Next go falls in the roof, looks like he says it’s tweaky on his arm and he’s done. Dmitrii held this swing but couldn’t get right hand up. 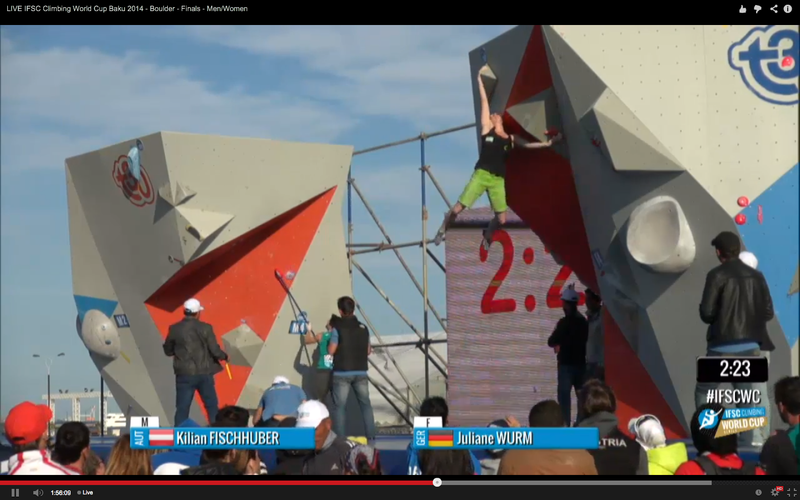 Kilian got through the bottom, then, like Dmitrii, struggled to hold the left triangle and then, unlike Dmitrii, fell before even trying to move his right hand. It doesn’t make a difference though, both got bonus first go. Next go falls in the same place but a little faster. Last go as time runs out he’s back on, the rock over and press into the corner looks uncomfortable, he falls out of the roof. If Rustam flashes he will get gold. He falls off trying to rock up under the roof. Next go gets bonus, falls. Ends up in 3rd. No one sends the boulder. 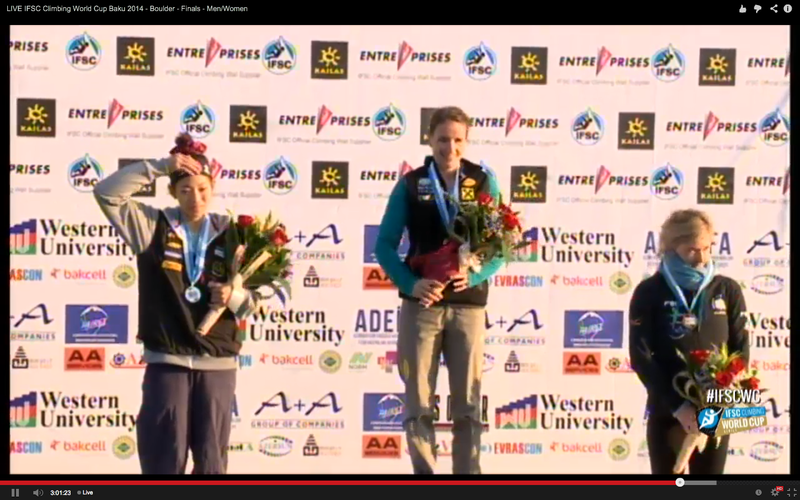 In the post-comp interviews both Anna and Shauna are quite gracious about the result. Anna says it isn’t ideal as they’d prefer to battle it out but some times you get lucky and that day she got lucky. 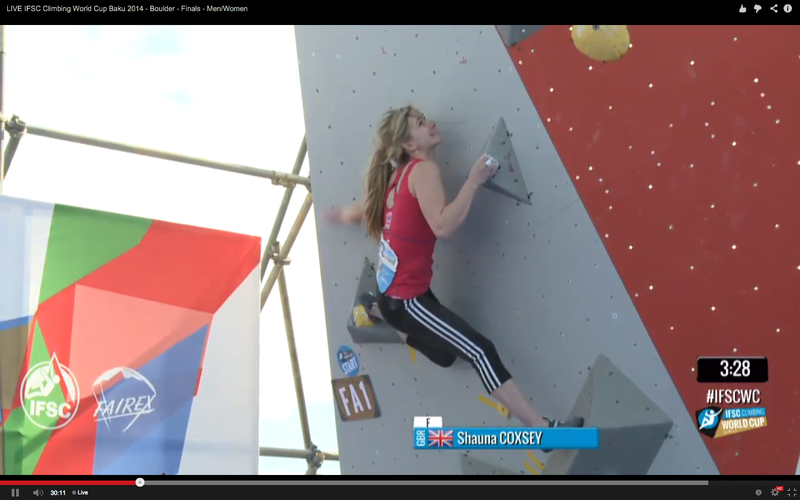 Shauna says she did her best and she feels good about her performance. 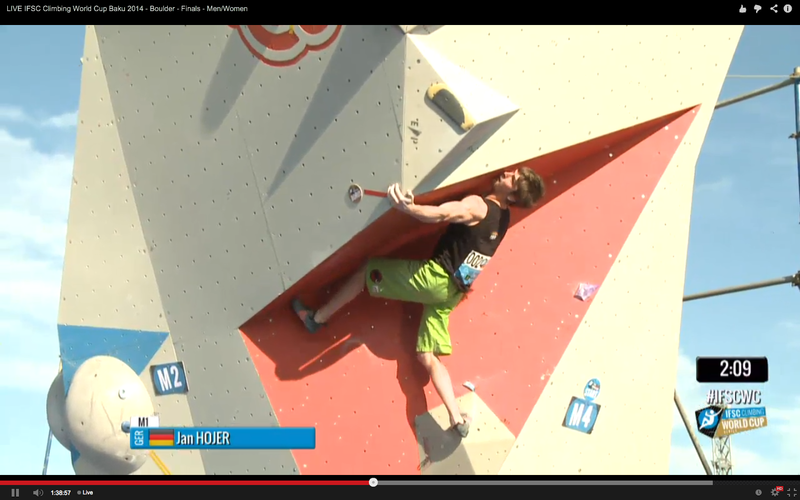 Next comp is in Grindelwald, Switzerland, next weekend May 10th and 11th. 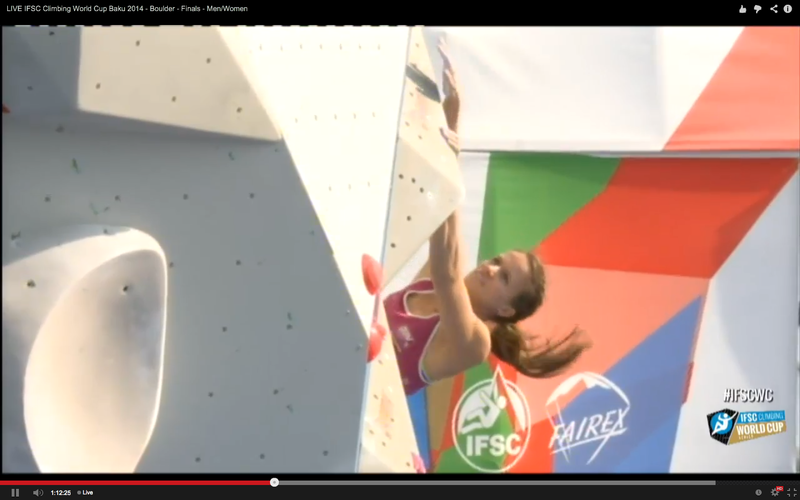 Regarding shauna:No doubt the IFSC judge in the background informed the -always- in experienced judges from the host country. In other shots you can see him (fabricio Minino) sitting on his knees in the background.